Mesothelioma and Lung Cancer for 25 Years. Mr. Sugarman has dedicated much of his career to obtaining compensation and justice for those who suffer mesothelioma and lung cancer from dangerous and defective asbestos products. He represents the workers who handled the equipment that built America and keep it running. Mr. Sugarman has won significant settlements against asbestos supply houses and distributors, installers and demolition contractors, and protective equipment companies whose work exposed clients to asbestos fibers and dust. For a complete listing of the trades and workers represented by Sugarman Law, please click here. For a complete list of the companies Sugarman Law holds accountable for mesothelioma, lung cancer, and other asbestos injuries, please click here. Led by asbestos, lung cancer, and mesothelioma attorney Barry R. Sugarman, Sugarman Law, LLC works with medical and scientific experts to win your case against the corporations that made and sold asbestos products they knew were dangerous and potentially fatal without providing workers with adequate warnings. He practices in New Jersey’s Mass Tort Court, which is dedicated to the litigation of mesothelioma and lung cancer cases for people whose lives have been seriously effected by asbestos. From investigation, medical consultation and detailed case preparation, he has consistently obtained substantial compensation for his asbestos clients. 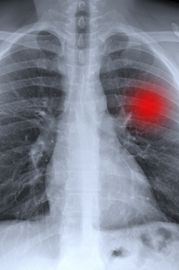 Lung cancer is a malignant tumor inside the lung’s airways that blocks your ability to breathe. More than 50 years ago, doctors and scientists studying asbestos’s dangerous effects determined there is a strong relationship between long-term asbestos exposure and lung cancer. If you smoked cigarettes and were exposed to asbestos, your risk of lung cancer is even higher than if you only smoked cigarettes, cigars, or other tobacco products. Even if you smoked, you have a right to sue the asbestos companies responsible for your lung cancer. Asbestos cases for lung cancer are tough because the asbestos companies believe they can prove your lung cancer is not asbestos related or it is somehow not their fault. Sugarman Law works for you to prove them wrong. For more than 20 years, Mr. Sugarman has been fighting your fight and taking on the asbestos companies to show the dangers of their products, prove their awareness of asbestos’ dangers, and hold them accountable for their decision to put profits before people. Whether you worked with asbestos serving our country in the military, in a shipyard, powerhouse or refinery, as a worker in a construction trades, or with some other type of asbestos exposure, Sugarman Law has the expertise to litigate your case against the manufacturers, suppliers, and installers of the asbestos products that you worked with and around during your career. Billions of dollars have been recovered for lung cancer victims and their families from asbestos manufacturers. A thorough investigation by Barry R. Sugarman and the experienced asbestos litigators he works with will prove your asbestos exposure and help us obtain the compensation that you and your family are entitled to as a matter of law. Schedule a Free Consultation – How Can We Help You? If you or a family member is suffering from or has died because of asbestos-related lung cancer, you deserve compensation and justice. Get in touch with Sugarman Law today by filling out our contact form or calling us at 732-877-1975. We are ready to listen to you about the situation nd speak with you about your legal rights today. Your consultation is free, and you will not be charged for services until obtaining a settlement.